Somehow, Bad JuJu convinced me that I owed him a burger. It just so happened that I was at loose ends and in possession of a shiny new Groupon for a couple of burgers at Fuku Burger. Metered parking was easy enough to find on the street. We found immediate seating at the bar. The bar at Fuku Burger featured a wide selection of beer and wine. The first thing that we noted upon entering Fuku Burger was that the whole place was decked out like a Lucky Brand Jeans commercial. We ordered a couple of Lucky Burgers (see what I mean?) and a family-sized order of fries.....our burgers arrived in about 5 minutes. 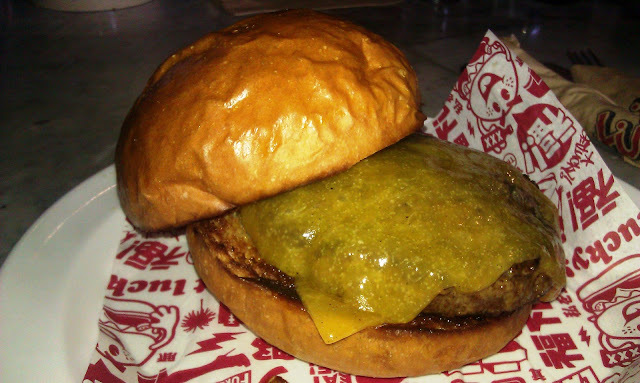 The Beef: Fuku Burger used Premium Black Angus in the form of pre-ground Chuck from Creekstone Farms. The 6-ounce burger patty in my Lucky Burger had a fat content of 20%. The burger was very juicy. The flavor was nicely beefy with a hint of aging. There was a mild trace of minerals. The burger presented a well-balanced and firm bite. The beef itself was not spectacular, but it was satisfying. The seasonings and the ginger are what rounded out the flavor profile. The Seasoning: Fuku Burger hit the exterior of the burger patty with just the right amount of salt to make that Chuck pop. The Sear: Fuku Burger got a competent, salty, and crisp sear on the burger patty. The sear was delivered by a properly hot, gas-fired flat-top. The seared layer was uniform and thin. This left the interior of the burger a nice, pink Medium. 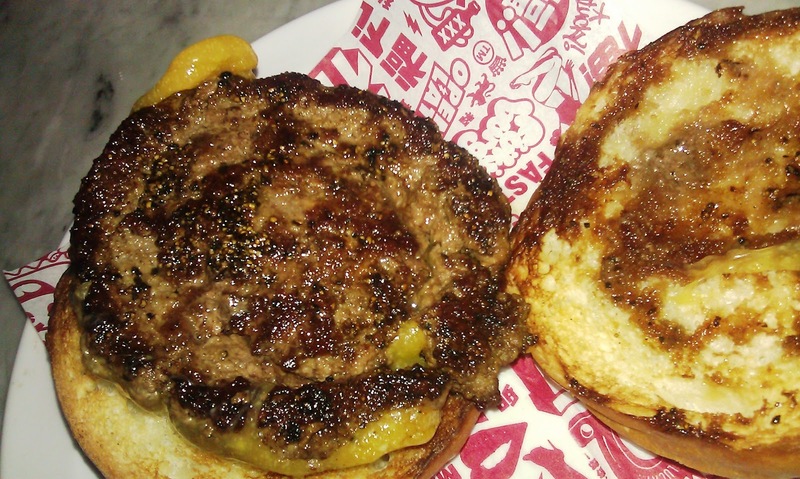 The Preparation: The thick burger patties at Fuku Burger were formed during morning prep. There was nothing rubbery about the burger. This meant that the ground Chuck, which was ground at a medium setting, was gently pressed into patties. It was not heavily manipulated. The Cheese: Blah....Tillamook Cheddar. Seriously, what is the fascination with this useless Cheddar? On the burger, it was bland, oily, and absolutely uninteresting. Pass on the cheese. It provided nothing but extra calories--the beef was flavorful enough. The Bun: Fuku Burger used a Portuguese Roll from Melrose Baking Company. The bun was mildly toasted with almost no crunch. The bun was buttered, but it was not overtly oily in the hand or on the palate. The flavor was mildly sweet. The texture was tender and just chewy enough to make its presence known. The Meat To Bun Ratio: The 6-ounce patty at Fuku Burger was perfectly matched to the Portuguese Roll. The Toppings: The lettuce and tomato were both perfectly fresh and fine. What was really worthy of note was the salty, pickled ginger. 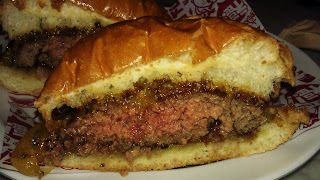 That provided an interesting blast of umami flavor, which absolutely rounded out the flavors of the burger. The ginger did the job of the weak cheese...in a heroic fashion. The Fries: We tried the fries with gravy and Fuku Sauce. This resembled poutine without the cheese curds. While the french fries were of the pre-cut, peel-off, par-cooked, and previously-frozen variety, the fries were fine. They were cooked to a pleasant crisp in canola oil. The Value: A Fuku "Lucky" Burger was $9. That was a little steep for a 6-ounce Chuck burger. Still, the burger was flavorful, and it was cooked properly. All told, at full retail, the value at Fuku Burger was about average for LA. Fuku Burger was about a block away from Stout. 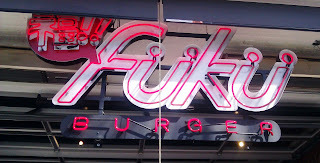 Fuku Burger was a world away from Stout in terms of flavor, quality, and speed of service. 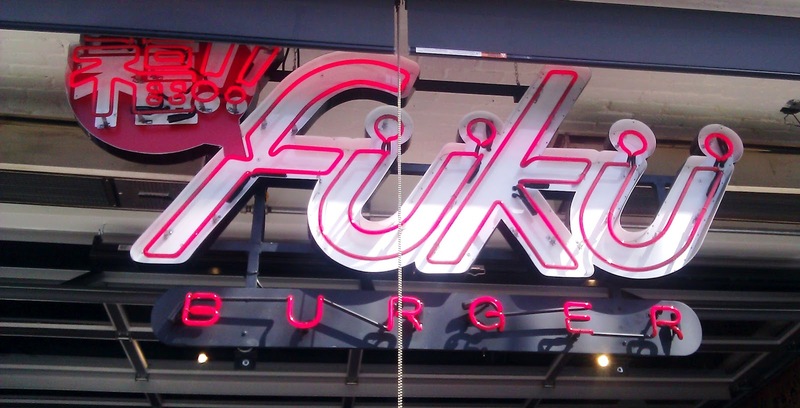 If you are in the area, and you are in need of a burger, then Fuku Burger would be the clear choice. 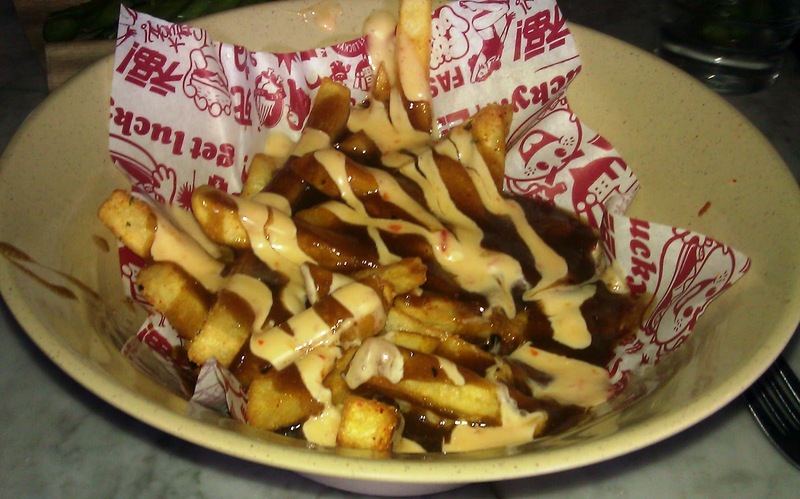 Burger Review : A darn fine and flavorful burger with a fusion twist was enjoyed at FukuBurger.